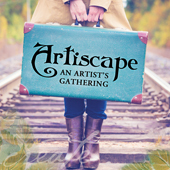 StencilGirl Talk (Day 1: 9/15/2015) – our host! This project is packed with techniques, including three different ways to use stencils! Make a photocopy of the Three Owls and a Branch Stencil. I put a sheet of light blue paper behind it when I copied it so I could see the details in the stencil. Trace around the owl using a thick marker. The goal is to outline the silhouette of the owl. Photocopy the tracing and cut out the silhouette. Cut out a rectangle of Cut Bond Create big enough to fit the owl silhouette. Peel off the backing sheet and apply it to a piece of black cardstock. Trace the owl silhouette on to the Cut Bond Create that’s applied to the black cardstock and cut it out using scissors. 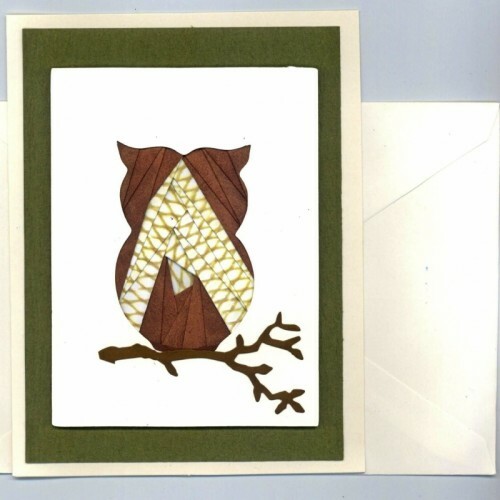 You should now have an owl silhouette that has cardstock on the back and Cut Bond Create on the front. Peel off the front of the Cut Bond Create to expose the adhesive. Carefully lay the Three Owls and a Branch Stencil on to the exposed adhesive. Center it on the silhouette. You should have a border as thick as the marker line that’s covered by the stencil. Lay pieces of Gildenglitz on to the exposed adhesive until it is all covered. Burnish the Gildenglitz with the Texture Sponge until there are no loose pieces. Remember to reclaim any Gildenglitz you burnish off. You can use those bits and pieces next time you gild! Slowly pull off the Three Owls and a Branch Stencil. I found it easiest to turn the piece upside down (so the stencil was against my work surface) and peel the cardstock away from the stencil. Try to avoid touching the exposed adhesive as much as possible so it doesn’t loose it’s stickiness. Sprinkle Mica D’Lights on the exposed adhesive. This “closes” all the exposed adhesive and “fills in” the lines that were covered by the stencil. Polish your gilded owl by going over it with cotton balls in a circular motion. Cut out a square of Cut Bond Create big enough to fit a circle as big as you want your moon. Peel off the backing sheet and apply it to a piece of black cardstock. Trace a circle on to the Cut Bond Create that’s applied to the black cardstock and cut it out using scissors. 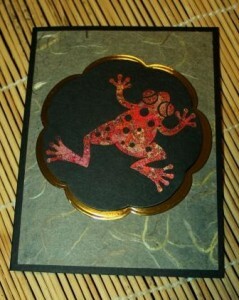 You should now have a circle that has cardstock on the back and Cut Bond Create on the front. Polish your gilded moon by going over it with cotton balls in a circular motion. Clean the Cigar Box to prepare it for painting by removing any loose labels, etc. If the box is very glossy, applying a coat of gesso (black gesso would be even better!) might make it easier to paint. Paint the entire box, inside and out, with Mars Black Perfect Pigment. Let dry thoroughly. Using a makeup sponge, dab Titanium White Perfect Pigment through the Night Sky Stencil on the cover of the box to create the stars. I like to put a very small amount of paint on Studio Paper and use that as my palette as it makes it much easier to dab paint on/off the makeup sponge. Let dry thoroughly. Stencil leaves around the sides of the box using three shades of green Perfect Pigment. Put three small “puddles” of Dark Green Perfect Pigment on a piece of Studio Paper. Add a very small amount of Wheat Perfect Pigment to one puddle of Dark Green. Mix well. Add a very small amount of Marks Black Perfect Pigment to another puddle of Dark Green. Mix well. Now you have three shades of green that will work well together since they all have the same base – Dark Green! Use a different makeup sponge for each puddle and stencil different size leaves around the sides of the box. I stenciled one color at a time, dried it with a heat gun, and then moved on to another color. Create a blue glaze by mixing Dark Blue Perfect Pigment with Clear Perfect Glaze. Remember, for it to be translucent, you must use more glaze than paint. 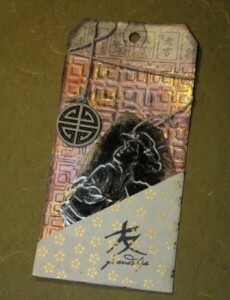 As soon as the paint “overpowers” the glaze, you’ll start to get an opaque color. I like mixing the glaze on a piece of Studio Paper. Brush the glaze over the top of the box to create a dark blue night sky. Let dry thoroughly. 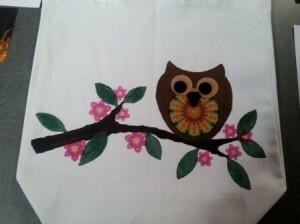 Apply masking tape to the Three Owls and a Branch Stencil to cover up the leaves and anything close to the branch. Create a dark brown embossing paste by mixing 101 Artist’s Cement Light with some Mars Black and Burnt Umber Perfect Pigment. Place the Branch Stencil on the lid of the box and use a Palette Knife to generously apply your custom colored dark brown embossing paste to the branch. Keep it a little thick. Gently dab a piece of bubble wrap in to the embossing paste to create little peaks and valleys. Then lift up the stencil. The end result should be a lumpy-bumpy branch! Let dry thoroughly – probably overnight – since the paste is thick. Remove the masking tape from the stencil and clean it with water right away so the paste doesn’t dry on it! Let the stencil dry too before using it again. Create a dark green embossing paste by mixing 101 Artist’s Cement Light with some Mars Black and Dark Green Perfect Pigment. Place the Branch Stencil on the lid of the box and line it up with the branch you created. Use a Palette Knife to apply your custom colored green embossing paste to the branch. Sprinkle Prills on to the exposed paste and gently push them in to the paste with your finger. Lift up the stencil. The end result should be leaves with Prills for texture! Let dry thoroughly – probably overnight – since the paste may be thick. Remember to clean the stencil with water right away so the paste doesn’t dry on it! 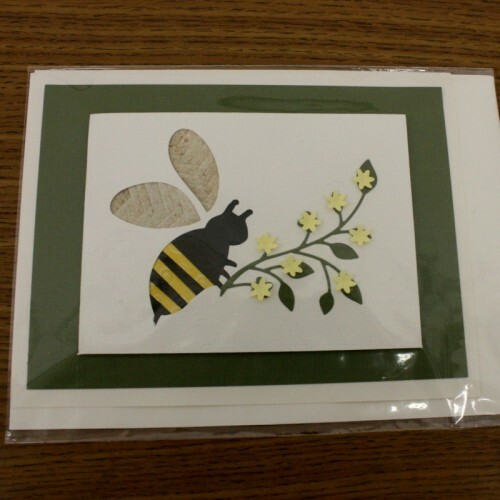 Lay out a piece of Fanciful Flowers Black Embossed Art Paper on your work surface. Tap your clean finger in to a little water and shake off the excess. Water should not be dripping from your finger. Rub your finger in to a color in the Mica Watercolor Paint palette. 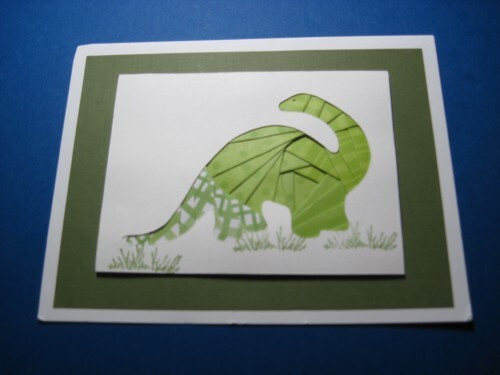 Gently glide your finger over the raised (embossed) parts of the paper you want to color. Repeat the process over and over again until you have the paper colored just the way you like it. I get the best results when I work with one color at a time and clean my finger before changing to a new color. Cut the paper in to pieces to fit the inside lid and the inside sides of the cigar box. Drill a hole through the lid of the box with the Proxxon Bench Drill Press TBM 115 and Bit. Insert the Idea-Ology 2-Part .375″ Hitch Fastener and screw tight. Adhere the embossed papers to the box using Great Tape Double Sided Adhesive Tape or your favorite Aleene’s Quick Dry Adhesive. Cut a piece of black felt to fit the inside of the box. Apply Great Tape Double Sided Adhesive Tape to the bottom of the felt and adhere the felt to the inside of the box. Adhere the gilded moon to the lid of the box using Great Tape Double Sided Adhesive Tape or Aleene’s Quick Dry Tacky Adhesive. Adhere the gilded owl to the lid of the box using Great Tape Double Sided Adhesive Tape or Aleene’s Quick Dry Tacky Adhesive. These techniques work great in art journals, on canvas, on ATCs, on cards and even on fabric! The glitter is fabulous, and I love the texture on the inside! Thanks for sending me the link Joe. This is an amazing project. I love the embossed paper piece. Wow! I love your project! I love the gilded owl and could see this hanging on the wall instead of sitting on a table. I love this project. Thank you for an easy to follow step-by-step. It makes what looked to be a difficult project seem a whole lot easier. Love all this inspiration from the blog hop! Oh, my gosh . . this is GORGEOUS!! Especially love the inside of the box. Thank you so much for pointing me to this, Joe! LOVE the step by step instructions. Am adding this to my “things to try” list. another wonderful project – this is beautiful, Joe. LOVE! I took a workshop with USArtquest products and learned gilding and other techniques! I’d love to try this out! P.s. Joe sent me! 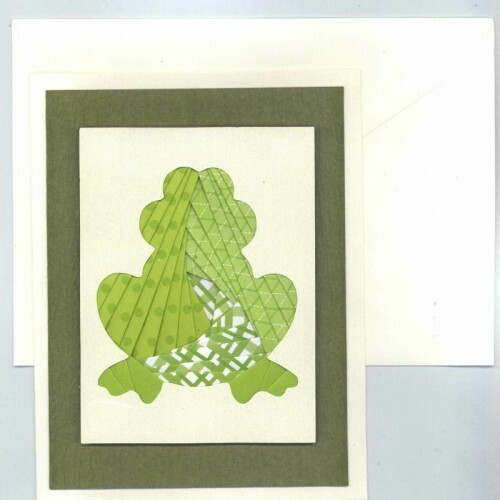 Joe sent me…I especially love the raised dotted abstract design inside…very cool! Looks like a fun project for classes and groups…. The theory of this project can be adapted to many things. Looking forward to giving it a try. Joe sent me, but the cigar box convinced me I needed to see this project. Thanks for the instructions. inspired me. Love all the technique. thanks. Another fabulous project. Love it!! What a beautiful exquisite piece this is. Love this project! And I happen to have some cigar boxes hanging around my house. Imagine that! I am so going to attempt to make a box worthy of this tutorial. Thanks for the inspiration! 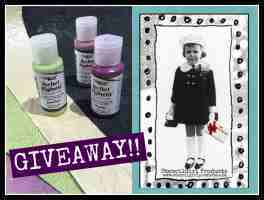 Jose sent me to check out these items and the giveaway! Joe, I love the Owl Box, I think you have outdone yourself! Love this for some friends who are OWL fans! Thank you for a beautiful present to give away! Joe sent me. Cute idea for a cigar box. This is stunning. I’m so glad the Owl Stencil spoke to you! Incredibly awesome box. I can’t wait to try this out! Thanks for all the inspiration! I love cigar boxes! I have several. The textured paper that you colored with your finger is so beautiful! Thank you for this wonderful tutorial. Joe sent me. Love this project! I have a friend who collects owls. this would make a wonderful present to give her for Christmas. I’ll be consulting your page for information on making this amazing owl. So this is an amazing tutorial. I love your website. And the box is fantastic! Gosh, so much to learn from this. Anyway, you put a lot of time into this project and tutorial. Thank you so much! cbee at inbox dot com. The embossed paper is so pretty!!! At first I thought it was metal embossing, but then I realized that it’s paper (I assume from Sue). Love the project! Joe, this owl is AMAZING!!! The glitter, the textured leaves…. What a lovely project, have been wanting to work with Mica, this may just get me started. Thanks for sharing the project with wonderfully detailed instructions. The chance to win a prize is fun. THis is just spectacular! The colors, the sparkle!! Thank you for the detailed instructions!! Wow! What a great project Joe. Love it all. And the detailed instructions are great to follow and make our own. Thank you for sharing. Truely stunning Joe but we expect no less from anything you do!!!!!! Hi Joe! What a great project!! Love the owl! What an absolutely stunning project! I just love the vibrant colors and textures here. Thank you for sharing the steps that you took to create this fabulous work of art!!! I LOVE owls and you did a fabulous job Joe! Great Box! Thank you for sharing your gorgeous art! I love the owl and the box. Just wonderful. Wow. Whhooo thought of this? Cute! Love this project! I really like owls, so this is one project I am going to make. Thanks, Joe. Pretty – thanks for the opp! I love this box! Whimsical, yet stunning. The colors meld so well and I want to touch it to get a feel for the yummy texture!! Nicely done, Joe! What a creative project, I love it! What a cool little owl on a cool box!! I love it! And your detailed description on how to create it is awesome!! Thanks so much for sharing this!! Owls are so popular now, perfect for the season, perfect for anytime. Your instructions are impeccable. Don’t put any really personal keepsakes in this box because people will not be able to keep their hands off this beauty. I want to pick it up and and look in it. Absolutely gorgeous! Plan to try this craft for sure! Thank you for the detailed instructions! What a neat owl, thank for sharing your work! This is awesome. I want!! I have some cigar boxes and I will have to make one. I love it. Beautiful project! I am saving the project instructions so that when I am finished in December with school I can finally do some fun projects. Thanks for sharing. Great job! Love the way is shimmers. The owl box is so beautiful. This will take a long time to make, but certainly worth it! Joe, I love the sparkling owl! Wow! I spent a lot of time reading this one. It is stunning. There are so many new to me techniques I am looking forward to trying. Know I have to make the moon for something spooky! The owl stencil is the best I’ve seen and the Night Sky is my new favorite star stencil. Like Joe M’s idea of a wall hanging-I want to give it a try on one of those wood slices with the exposed bark-just seems to go together in my head. Great great work! I just love the sparklyness of the cigar box! That is a nice box. Anyone would love it the store a few of their favorite things in. Stunning box and great detailed instructions. Thanks for sharing the step by step process. Thanks .Hopfully I’ll be making one for Christmas. But am willing to win one d/t the time constraints I am currently under. I always enjoy your creations.keep them coming. This looks fabulous! I love the gilding and sparkle. Thanks so much for including directions to this great project! The owl box was fabulous. Thanks for the instructions. Now that’s thinking outside the box. Well done! Beautiful!! Thanks for the inspiration!! ole, what a fabulous project! I love everything about it. Also love learning of new products. Beautiful. The instructions are so detailed and usable. Thank you. I had some computer issues so I may have accidentally commented twice. Joe, you’ve inspired me again. I have a basket full of boxes I’ve been holding on to. Now I know what I will do with them. Thanks, Joe. I had to add one more things…Joe, you are so clever! How did you make your photo sparkle?! That is a tutorial in itself! Keep sparkling! how cool is this? 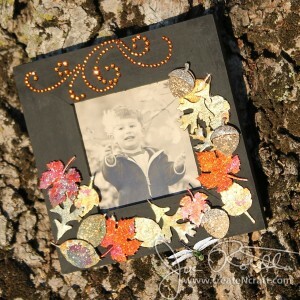 bet you can tell from my blog name I love this project–Glitter In My Kitchen. this turned out beautifully! Love your owl box, it’s beautiful! HEY DUDE, TWINKLING WORK, CAUGHT MY EYE! This project is AMAZING! I love all of it, and the way you worked with the paper on the inside of the box is stunning. Thanks for the inspiration!